I love growing plants. Once upon a time, when I lived in my first apartment, I attempted to cultivate a green thumb only to have a myriad of random happenings kill off the two plants I started with. 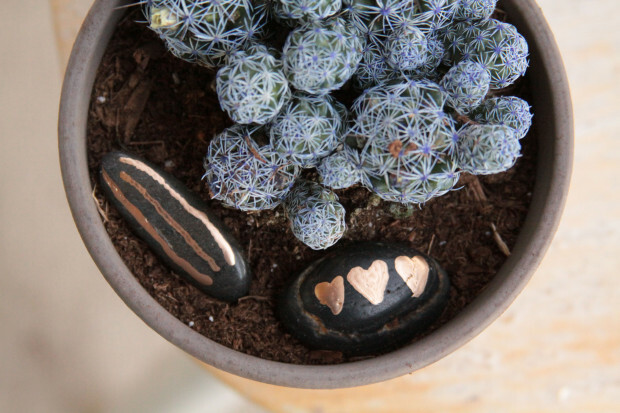 And they were hearty little cactus. But even those little warriors of the plant world will succumb to the constant gnashing of kitty cat teeth. I was discouraged and did not buy another plant for a long time. 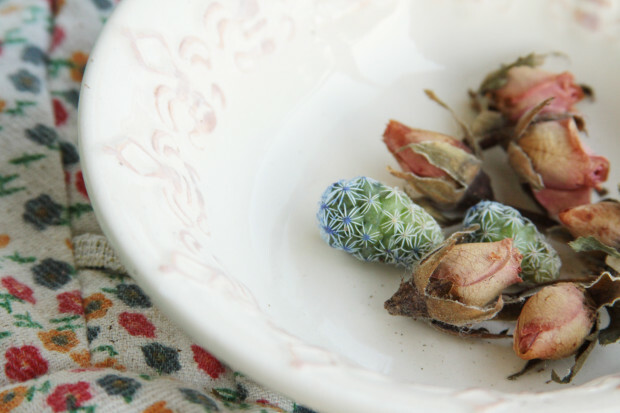 Then I saw the cutest idea: to start seedlings in tea cups. This solved two problems for me, my love for teacups but lack of enjoyment from tea and my desire to cultivate plants. I could start off small and work my way up. For four years now I’ve been growing plants; from seeds to seedlings to fully mature living things. I’ve learned so much along the way including how to make the most of my beautiful little garden. Periodically I clean out the old and make way for the new. 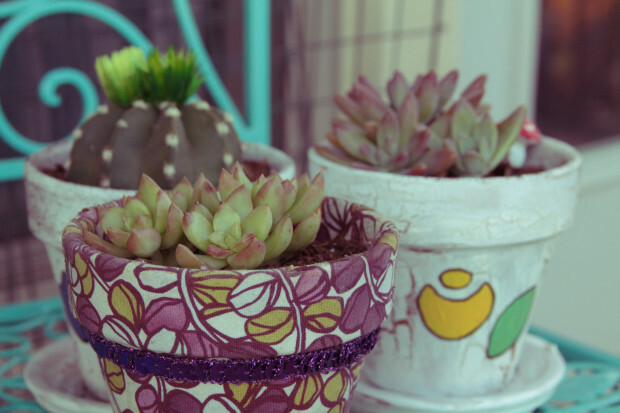 And I am a sucker for succulents, which can be difficult to rear. 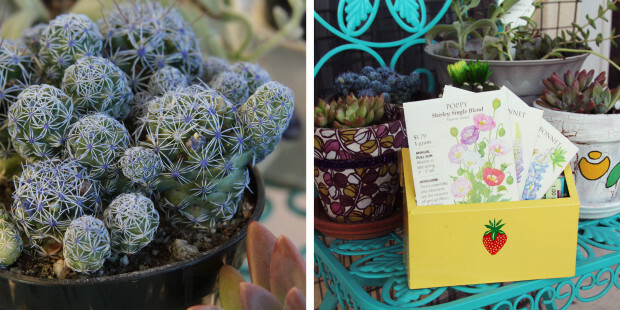 Over the years I’ve collected several neat ways to spruce up my garden with fun DIY projects and decorations. 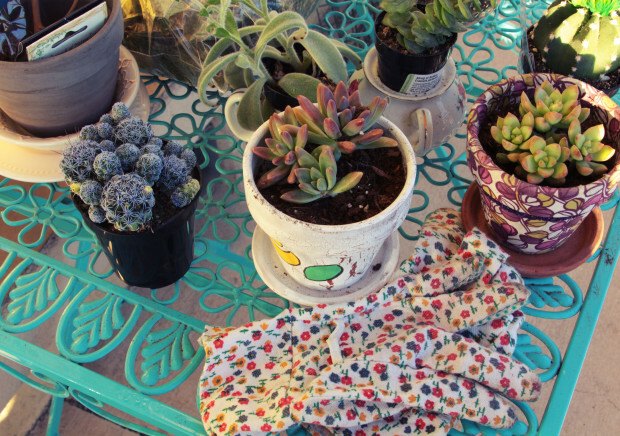 I hope they inspire you to begin cultivating your own “green thumb”. 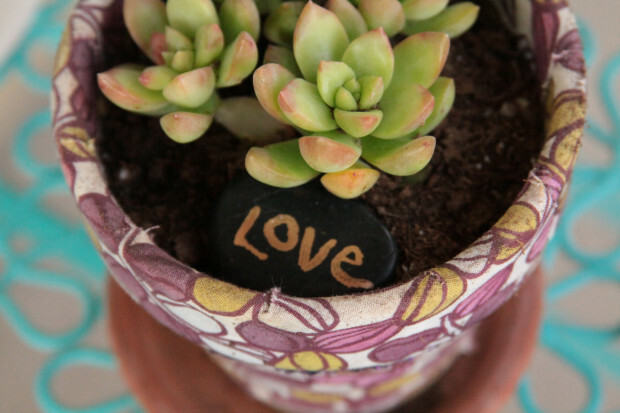 Add fun to your arrangements by inserting things into the soil. 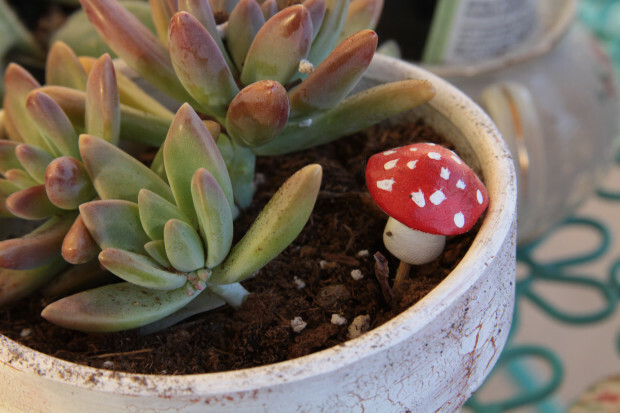 I enjoy making small mushrooms out of polymer clay and setting them on toothpicks. 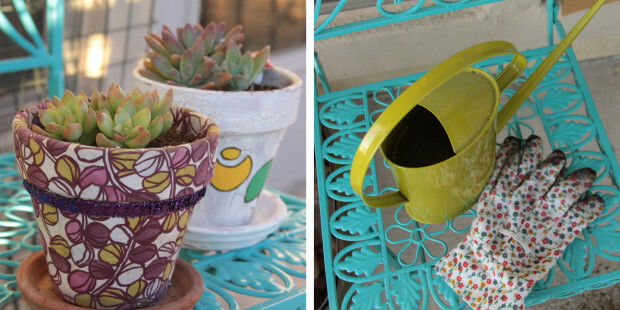 Below I give you a few steps on other fun stuff you can put into the pots to make them pop! 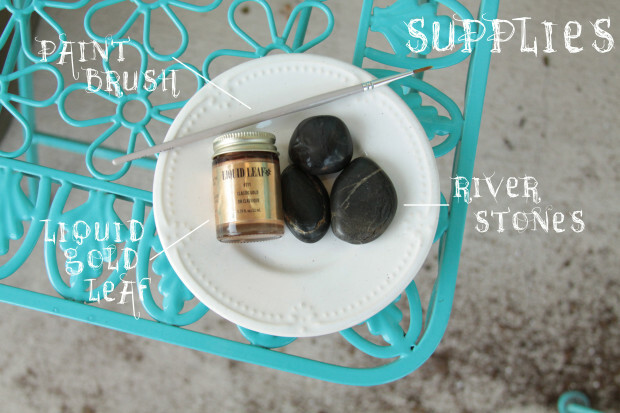 Make your own river stone charms that nestle nicely in the soil of your plants. 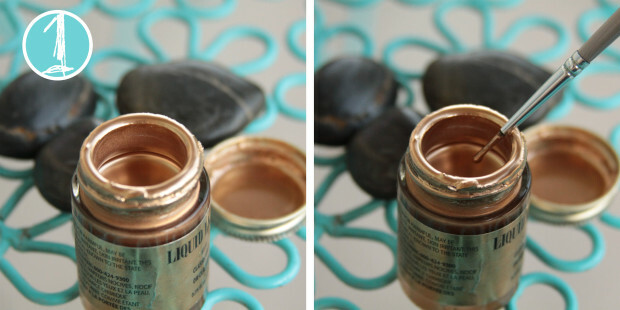 Using a brush you don’t mind possibly being ruined, dip into the liquid gold leaf. 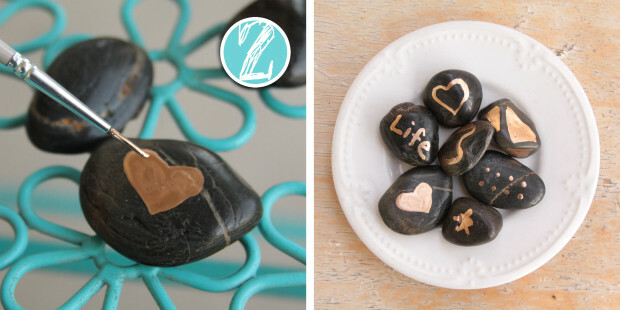 Paint onto your stones! Simple as that. Now when the sun shines down on your plants these lovely little gems reflect back the light and cast a warm glow. 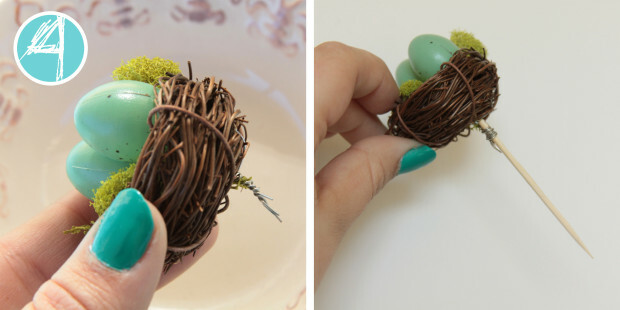 Another cute way of adding a touch of whimsy to your garden is by making your own birds nests. I found all the supplies for this at JoAnn Fabrics. 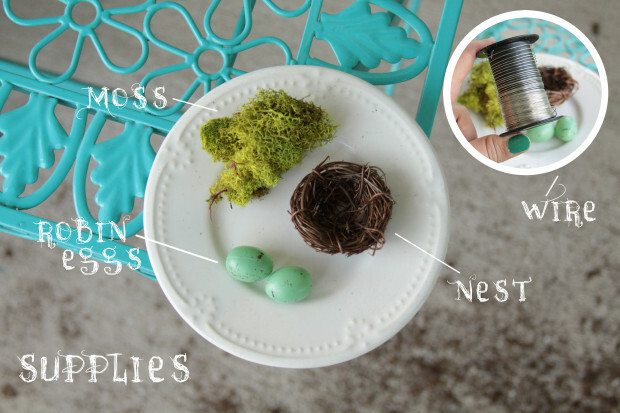 The nest and eggs were already pre-made so that made it even easier to put together. Cut a length of wire from your spool. 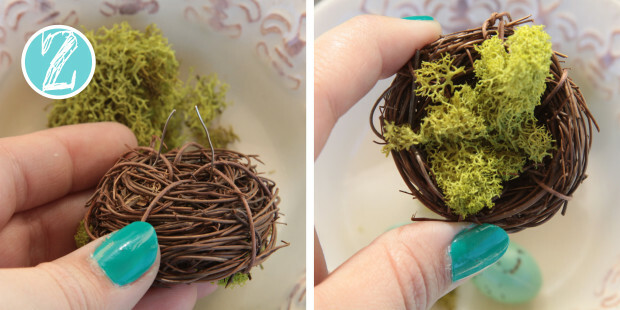 Bend it into a U shape and insert through a clump of moss so it sticks out the other side like pictured above. 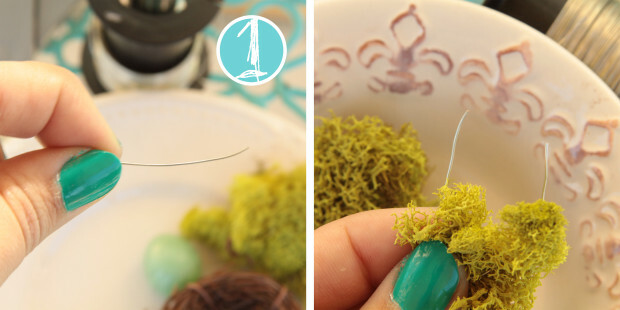 Gently push the wire ends through the wound birds nest and then twist them together so it holds the moss down. Cut another length of wire and fold it down near the top. Insert this into the small hole at the bottom of the egg until the end of the folded piece is inside. This will keep the egg from falling off the end of the wire. 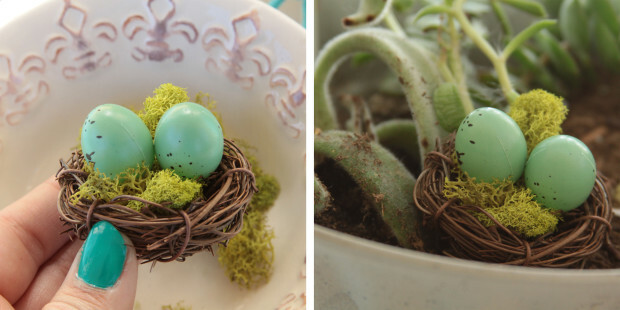 Push the wire through the nest the same way you did the moss and twist it into the other wire. 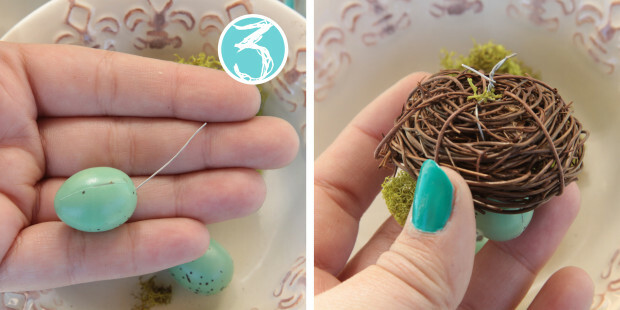 Complete Step 3 for as many eggs as you would like to add to your nest. Make sure to twist all wires together into one. 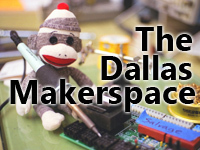 When you’ve added as many as you desire, wire wrap a toothpick into the small wire stem you created. 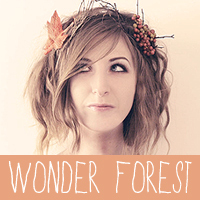 Now you can press it into the soil and add that little flare of the fantastical to your garden. There are countless ways to make a garden your own and I’ve only just begun to scratch the surface. I hope you enjoyed another taste of spring! 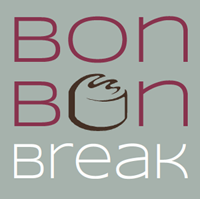 Coming up in a couple of days is another Giveaway! Stay tuned for directions on entering. Happy Making! I missed this entry somehow! 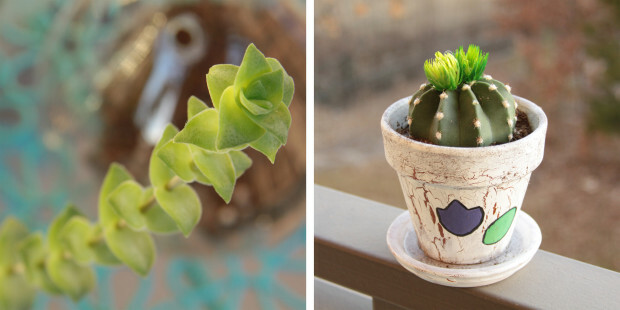 These are really cute and fun ideas! 🙂 Interesting too since I didn’t realize you did some of the stuff you mentioned and described here!